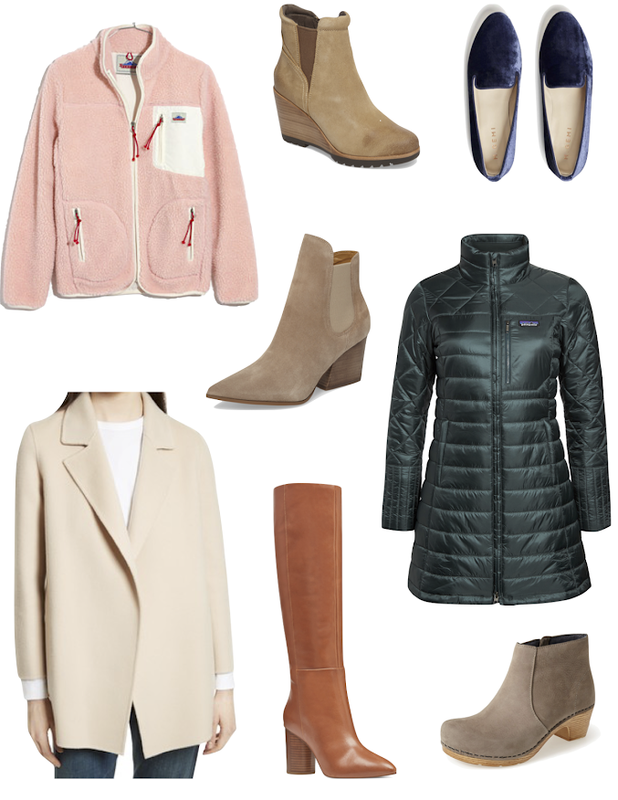 Yes, everyone is talking about the shopbop sale- so here are my picks (except the sneakers those I just randomly love). For three days only receive 20% off orders under $500 then 25% off orders $500 and over. 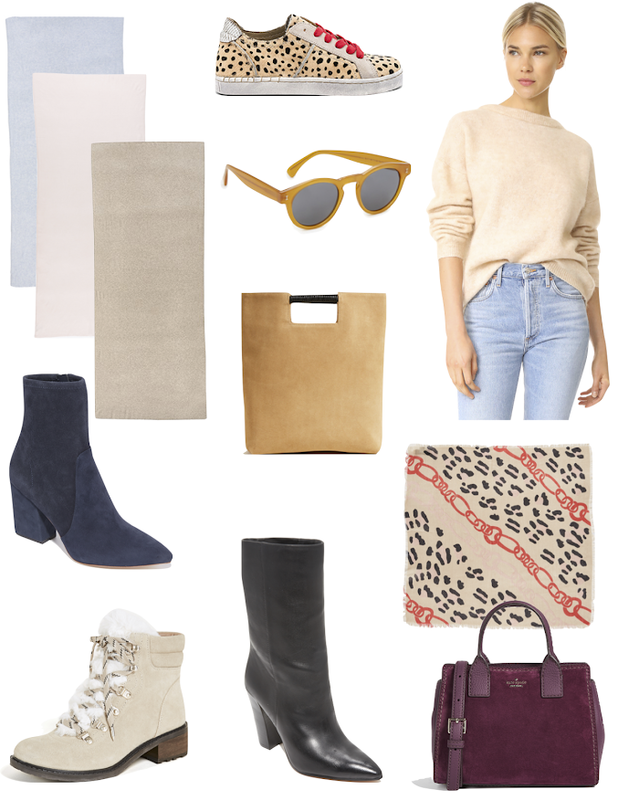 My number one pick is the white + warren cashmere travel scarf. It's the perfect luxe accessory for fall and winter. My sister gifted me one years ago and I am HOOKED! The aviator jacket is a must for me! I just grabbed the above sweater in anticipation of a cozy fall. I love that the price is SO reasonable and it's a company I grew up with. It's actually a men's sweater so I'm looking forward to an oversized fit. 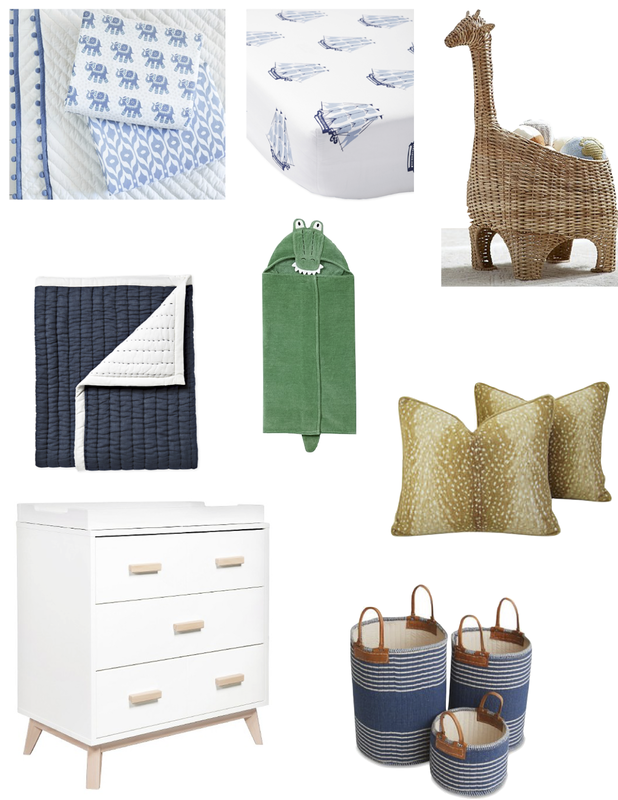 I'm also planing on picking up a little boat tote to use as a diaper bag. 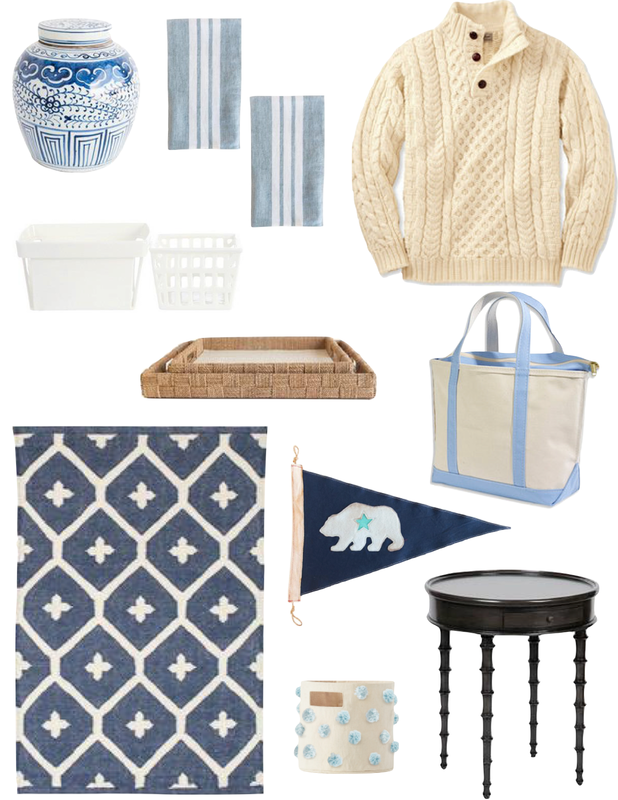 Those napkins are calling my name, the pennant reminds me of my little sister, and I'm loving the rug and side table. Versatile pieces to elevate your basic jean look this fall. 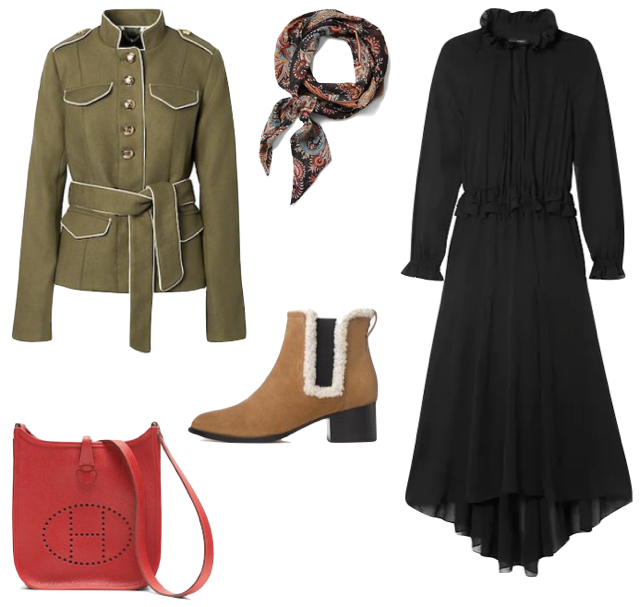 I love how outerwear and shoe selection can change the entire tone of your outfit. These selections will carry you through most weather and cater to your moods. Some days all I want is a Patagonia and kicks. Other times, a cape and coordinating boots makes me feel comfortable yet put together. 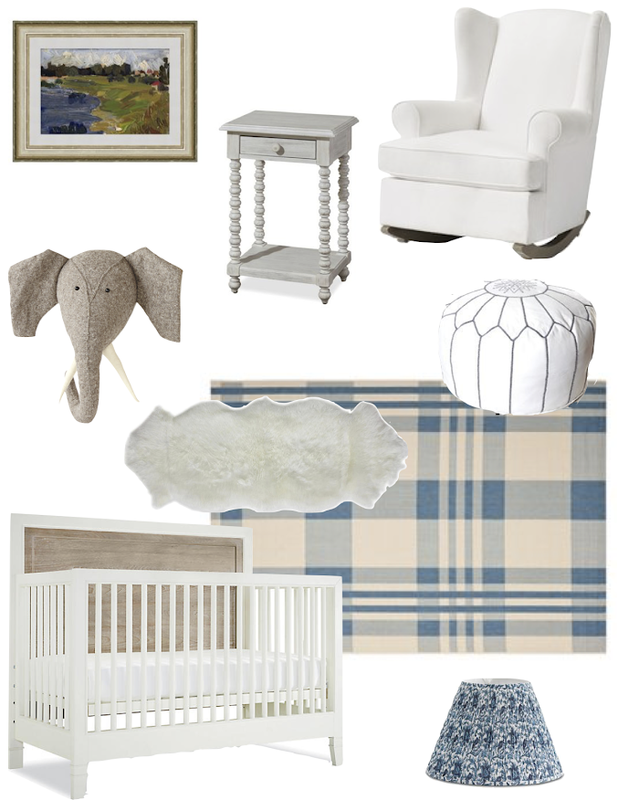 Some sweet blue and white Nursery inspiration. Because, how could I resist!? Calling all Moms (Dads too)! 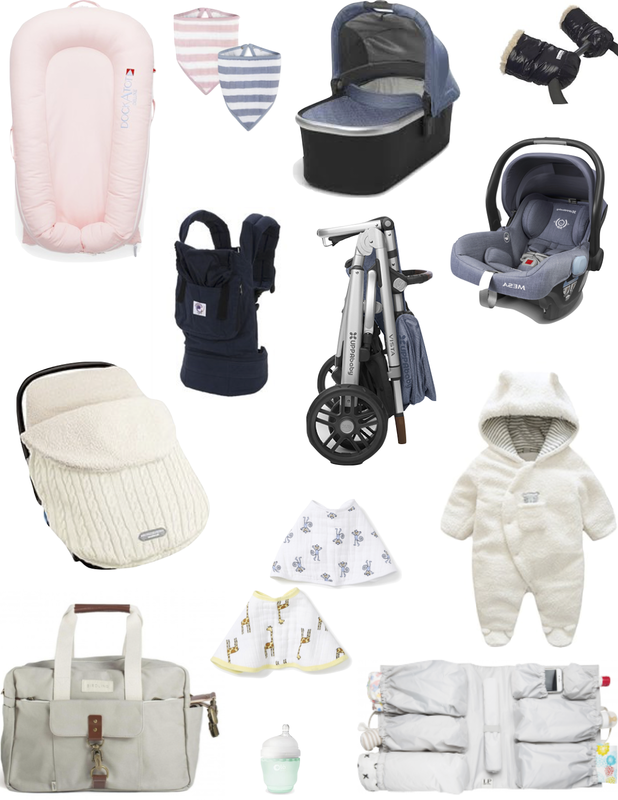 The amount of baby gear out there can be totally overwhelming. 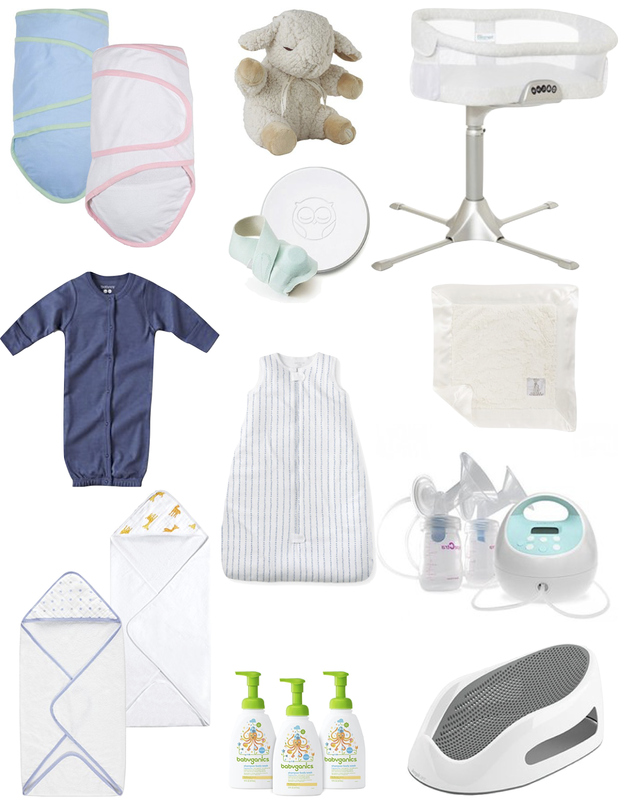 I've put together my first post of "must-haves" for baby and would love your feedback. 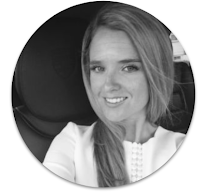 My choices are based on my own research paired with personal recommendations from friends and family. I'd love to hear what were your go to products? Miracle Blanket swaddles- I've heard that swaddling can be tricky and that this brand makes the process a breeze. Sleep Sheep: I love that you can secure this little sound machine to the outside of the crib. With city noises I'm sure I'll be using it quite a bit! I like that the machine is removable, and has two sleep-timer options (23 + 45 minutes). I also love that "mother's heartbeat" is one of the sound options. Owlet Smart Sock: Very interested to know if anyone has used this baby monitor! It seems like it would potentially create total peace of mind during the nights. Apparently, it uses clinically-proven technology to track your infant's heart rate and oxygen levels. The information connects wirelessly to a base station designed to notify you with lights and sounds if something appears to be wrong. Using the app you can view real-time data and receive notifications on your phone. Halo Innovations Bedside Swivel Sleeper: This bedside sleeper offers the convenience of cosleeping paired with the peace of mind that your baby is safe in their own protected space. Sound amazing to me! Spectra Breast Pump: No clue in this department but I have been told you really need a good one and this brand has great ratings. Baby Organics: I've heard nothing but good things about this line and love that it is fragrance free, dermatologist tested, and has plant based natural ingredients! Angelcare Bath Support: I love the simple design and affordable price of this little tub. Docking Sleeper Station: Not sure if this item becomes redundant when you have a bassinet? All the reviews I've seen are super positive. VISTA Convertible Stroller with Bassinet & Toddler Seat: Wow could there be any more stroller options! I definitely want to get this purchase right because city living means this will be used daily! I love how this option has the bassinet, seems easy to fold, and will work with this car seat. I also want to grab these mittens because they actually attach to the stroller! Another key winter accessory I want to use is this knit Bundleme. Ergobaby Carrier: I know there are warnings and concerns about hip dysplasia but I've heard that this model is a good choice. Birdling Weekender Diaper Bag: I was first drawn to this bag simply based on aesthetics but then I saw how incredible functional the pouches and pockets are on the inside. ToteSavvy Organizational Insert: This quickly turns any large tote into an organized diaper bag! Shop the edit below by clicking the picture. Also, let me know what products you love and would recommend!